1. To save a community heirloom, the historic Snellgrove/Sparks Homestead, through its purchase, restoration and reuse as the Boaz Area Cultural and Visitor Center to preserve the history of the structure and celebrate the role of its original family in the founding of Boaz. 2. 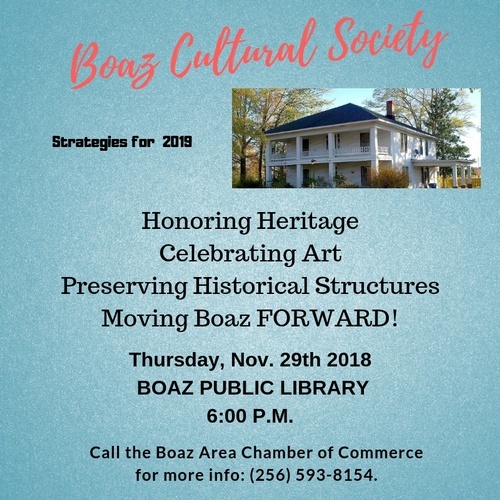 To enhance the cultural life of Boaz Area residents by honoring the area’s art, history and heritage by sponsoring an annual calendar of varied artistic and historical temporary exhibits and programs such as art fairs, classes, workshops, and special events. 3.To enhance the tourism potential of the area through the development of a permanent collection of unique exhibits which appeal to all segments of the public. 4. To build bridges between the citizens of our community by involving people, organizations and businesses throughout the area including our schools in the development and management of activities of the Cultural and Visitor Center. Last Thursday of each month unless otherwise noted. Currently no fee to join the society or attend meetings.